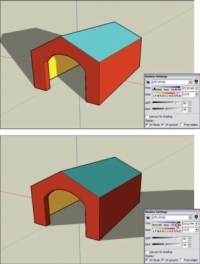 1Use Orbit, Zoom, and Pan to get an aerial, three-quarter view of your doghouse model, sort of like the one shown. You can use Use Orbit, Zoom, and Pan to navigate around until your model, whatever it is. 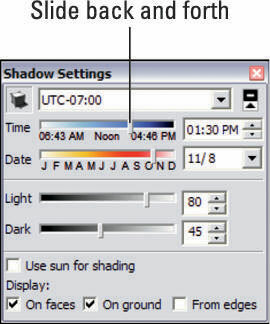 This opens the Shadow Settings dialog box shown. The Shadow Settings dialog box controls the position of SketchUp’s built-in sun. 3Click the Display Shadows button (in the upper-left corner of the dialog box) to turn on the sun. Your doghouse casts a shadow on the ground. 4In the Shadow Settings dialog box, move the Time slider back and forth. 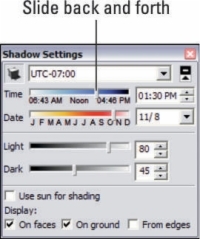 Changing the time of day means that you’re moving SketchUp’s sun around in the sky. When the sun moves around, so do your shadows.